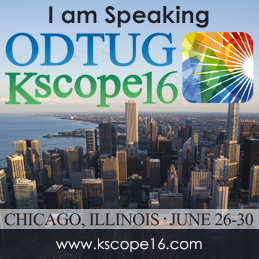 Meet us in Chicago (US) end of June at Kscope16 ! I will be speaking at this year Kscope, one of the best conference about Oracle tools, about OBIEE security. A must-attend session for any OBIEE developer, administrator or project team member to get all the key information to safely setup a security model able to protect your data and robust enough to meet the new requirements you will have in the future. Feel free to get in touch directly during the event, between a session and another or during one of the many networking or socializing events. You can also get in touch using the contact details here on the site to fix a meeting for a more detailed and private talk about your needs, questions and how DATAlysis can support you.